TECHNOLOGIES Micky Edwards Amagi Television was originally created to be a mass communication platform. Yet, over the last few years, it is becoming increasingly hyperlocal. There are several reasons the television industry is transitioning from a broadcast to narrowcast schematic. One is monetization. According to Borrell Associates, local advertising is a $115 billion market, and estimates show that digital spending in 2015 will account for 42 percent of all advertising within the local space. That’s a lot of revenue that broadcasters limited to a single geographic region could potentially miss out on. In addition, the trend towards hyperlocalization enables broadcasters to offer targeted content and advertisements, especially with the growing demand for a multiscreen TV experience - from TV sets to PCs, smartphones, and tablets. In its Global Entertainment and Media Outlook for 2013-17 research report, PriceWaterhouseCoopers (PwC) has predicted that the growth in the OTT market is likely to touch $17.44 billion by 2017 as streaming and Internet-to-TV services become more prevalent. In the same report, PwC highlights that homes will spend increasing amounts on OTT, and purchases and subscriptions made through the TV, amounting to $1.28 billion in 2017. As such, the hyperlocal content and advertising segment will unfold at a rapid pace in the coming months. Hyperlocalization also allows broadcasters to meet broadcast regulations and content rights requirements that are speciﬁc to a particular country. For instance, some countries permit the advertising of alcohol and some do not. TV networks need an easy and affordable way to replace those ads on a common feed. The challenge is how to distribute hyperlocal TV across multiple platforms in the most efﬁcient and cost-effective means possible. Traditional satellite and ﬁber-based models are too expensive for hyperlocalization due to high CAPEX costs which, in turn, put pressure on ROI expectations. This article will explain why broadcasters are turning to the cloud to deliver hyperlocal TV, highlighting the speciﬁc beneﬁts and applications. 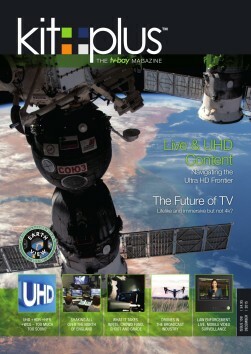 50 | KITPLUS - THE TV-BAY MAGAZINE: ISSUE 108 DECEMBER 2015 Benefits of Using Cloud for Hyperlocal TV Leveraging the cloud, broadcasters can gain increased scalability, streamline the distribution of television content, and dramatically reduce infrastructure expenses. Let’s take a look at three speciﬁc workﬂow areas where broadcasters are ﬁnding cloud infrastructure to be beneﬁcial for hyperlocal TV. First and foremost, the cloud is a great way to reduce storage costs. Whenever a broadcaster decides to start delivering hyperlocal playout, they can expect storage costs to rise in parallel with the additional assets they’ll be distributing. By storing assets on the cloud, broadcasters do not need to make a large capital investment in data centers or tape archives. They can pay as they grow. From a playout perspective, a cloud-based infrastructure provides broadcasters with more ﬂexibility when it comes to expanding into noncontiguous geographies. For example, let’s say that a broadcaster in the UK wants to cater to audiences in Germany, the Middle East, Australia, and Canada. The TV network would have to build a satellite infrastructure that covers each continent. Given the cost of satellite-based content delivery, that’s quite an expensive undertaking. What’s more, a separate satellite feed would be required to expand into each additional market in other geographies in the future. With a cloud-based infrastructure, broadcasters can push their entire content just once, and then start delivering content to regions of their choice in an easy and affordable manner. The regions can be as far apart as Australia, the UK, and Canada. In this case, the broadcaster can even hyperlocalize content speciﬁc to each region. Ultimately, a cloud- based playout approach provides opportunity for hyperlocal playout and monetizes content at a reduced cost.